When Nick Mason made comments in Italy about heading out to small venues, to play early Pink Floyd songs, few took the remarks seriously. As unlikely as it seemed, Nick was entirely truthful and in the initial announcement a set of four shows in London were announced for his new band. Due to the critical success of those shows, held in small venues in Camden and Putney, a full European tour has been announced with this date one part of this. 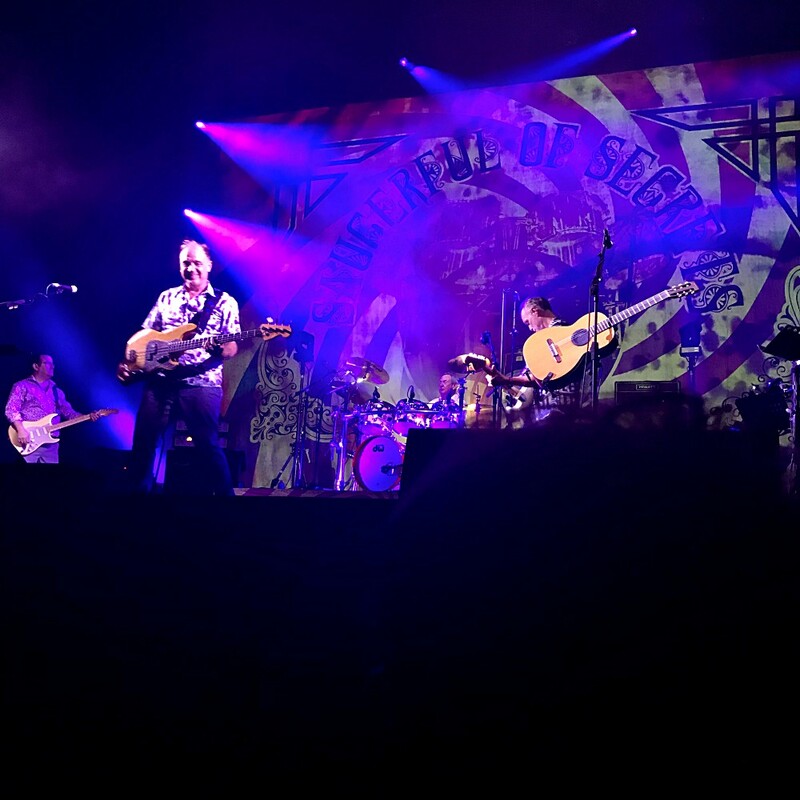 Nick Mason's Saucerful Of Secrets brings together some familiar names, all great musicians: joining Nick are Gary Kemp and Lee Harris on guitars, Guy Pratt on bass, and Dom Beken on keyboards. Kemp is best known for his work with Spandau Ballet, Harris as having played guitar with The Blockheads (Ian Dury's band), Pratt needs no introduction, and Beken is principally known for his work with The Orb, and Transit Kings (with Pratt). The band will be playing early Pink Floyd songs. The regular sale of tickets started on June 1st at 9am CET (local time) through Digitick.com. Our thanks to Julien Richard for the ticket scan shown to the right. MAIN SET: Interstellar Overdrive, Astronomy Domine, Lucifer Sam, Fearless, Obscured By Clouds, When You're In, Arnold Layne, Vegetable Man, If/Atom Heart Mother/If Reprise, The Nile Song, Green Is The Colour, Let There Be More Light, Set The Controls For The Heart Of The Sun, See Emily Play, Bike, One Of These Days. Yesterday's wildly enthusiastic crowd in the standing-only Luxembourg show were always going to be hard to top. A great show in Paris, but one tempered by ushers stopping people standing, taking pictures, and so on. 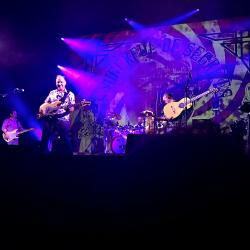 The atmosphere therefore turned out to be quite different to the previous gig - not that this affected the performance. 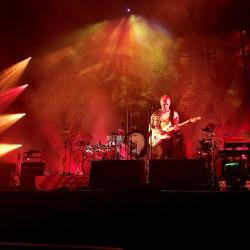 For this latest show on the tour, during his initial thanks and welcome to the audience, Nick said: "Well, we are not the Danish David Gilmour, or the Australian Roger Waters or the People's Republic of Korea Roger Waters even. We are Nick Mason's Saucerful Of Secrets! We're thrilled to be here tonight - for some of us, it's our first time playing the Olympia, and it's such a special place, certainly for me. I'm really, really pleased to have finally got here after 52 years or whatever. Thank god for Google Maps!" Certainly that sense of fun and enjoyment comes across so clearly in the performances. Definitely a show to catch if you can! Our thanks to BD contributor Jerome Ravon for the picture of the marquee outside the venue, on the night of the show. The band now travel to Dusseldorf in Germany for the show there tomorrow, before having a well-earned day off on Wednesday. We'd love to know from those attending how they felt the concert went. 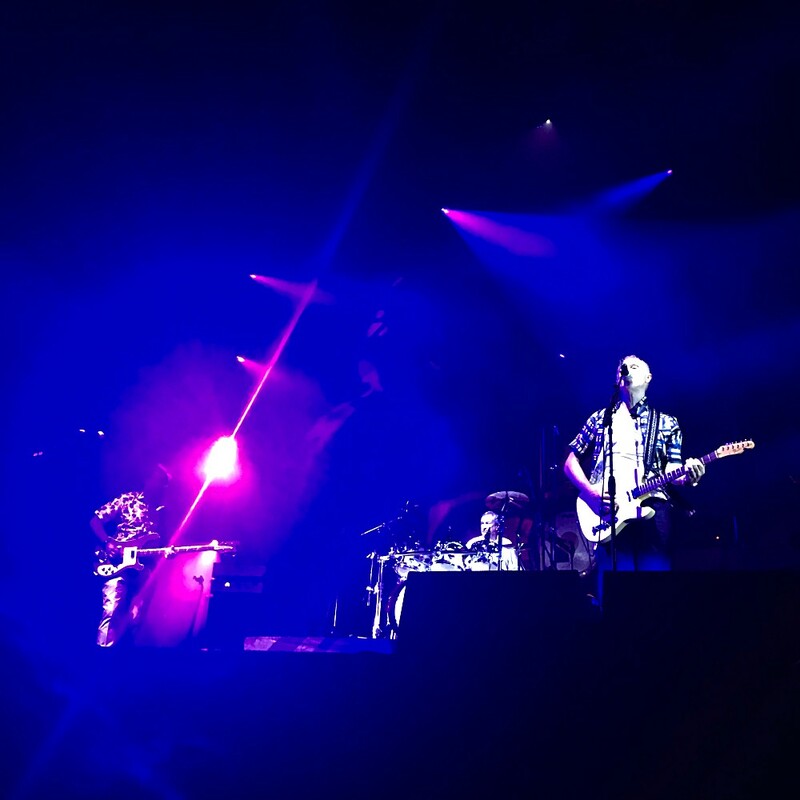 How was the show for you, if you were one of the fortunate ones to attend? Let us know what YOU thought! 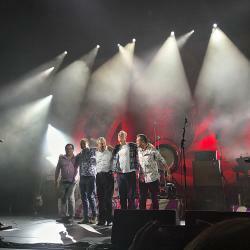 What can a 75 year-old drummer bring to a bunch of die-hard fans of Pink Floyd? Between an ex-leader, still genius, with a spectacular show, playing the hits in front of large audiences, and a guitar hero, proposing some new tunes, not always great, but totally refreshing, what can he bring? Answer: so much. Last Monday, at the famous Olympia of Paris, sitting on these wall-known red chairs, the French fans were totally blown away by such a great setlist, of these almost forgotten songs (Vegetable Man, Green Is The Colour etc.) and these antiquities such as Set The Controls For The Heart Of The Sun or Atom Heart Mother. With an efficient rock band, Nick Mason offered to the fans a saucer full of surprises, a gigantic bowl of emotions and a cauldron of thrills. 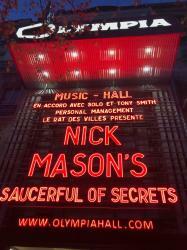 What a surprise when Nick Mason and his Saucerful of Secrets announced a mini European tour in late spring! We were taken by the ruffling European tour Us + Them led by his pal Roger Waters and we could not imagine that Nick could return on stage after 13 (24?) years far from the circuit. We thought he walked away. We were wrong. 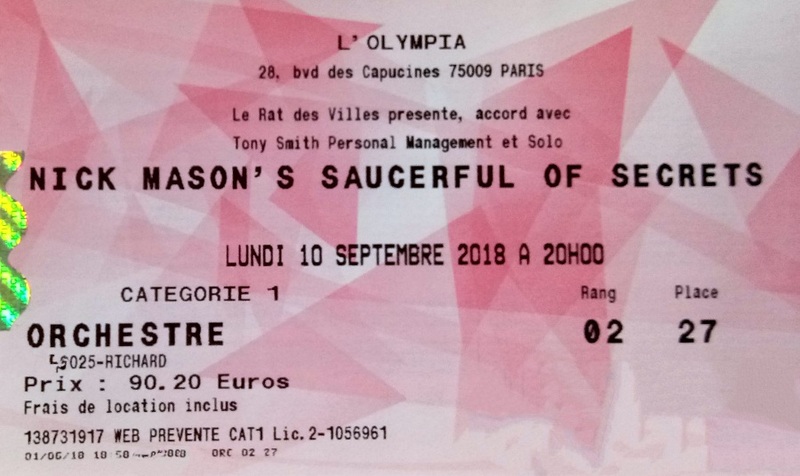 For the 7th of his concerts, Nick chose the Olympia to offer the French the gift he gives us all. A mythical place having seen all the greatest artists, but never Pink Floyd! The hall has a capacity of 2000 seats, which was too small for the group's passages in the 1970s. The room is filled with greying heads but younger fans also made the trip. 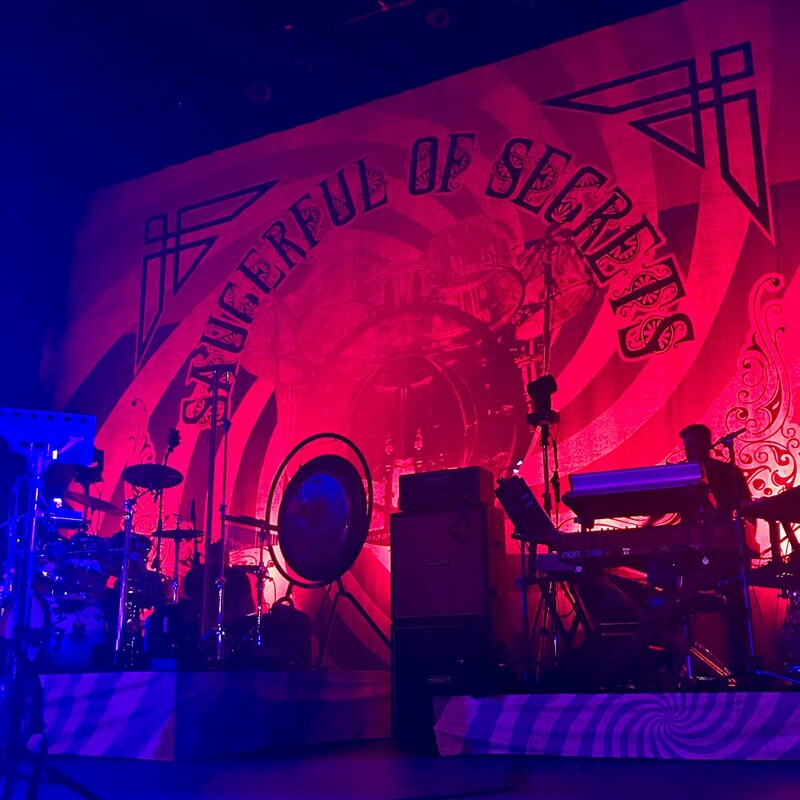 The entire width of the stage is occupied by a backdrop panel printed with the very late 60s inspired logo of the new formation surrounding the legend drummer. The drums are located in the centre of the device, indicating who will be the conductor. 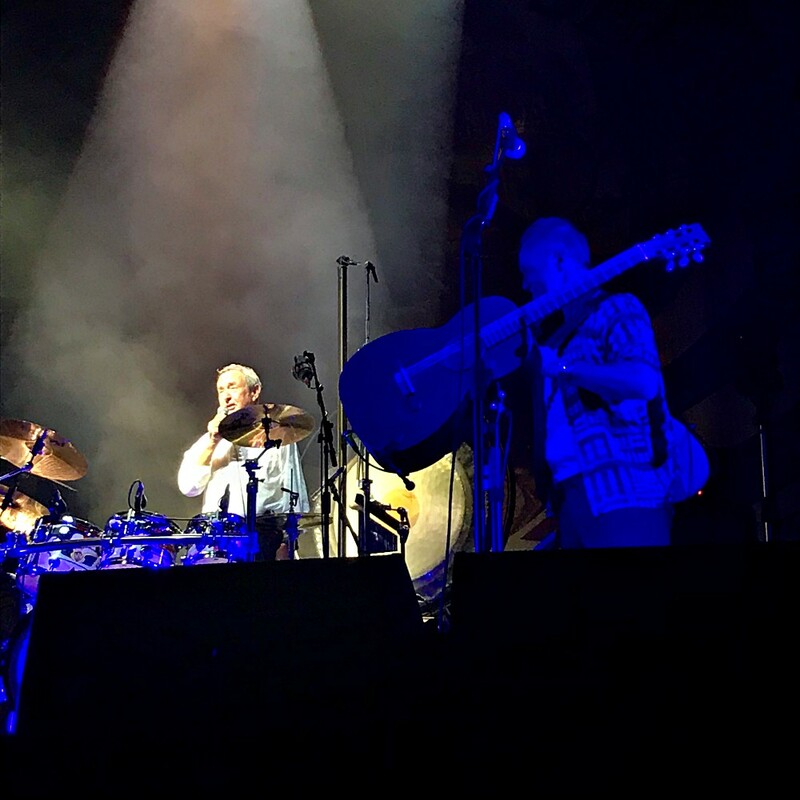 At 9PM, the band broadcasting sounds reminiscent of the one used by Pink Floyd in 1994 decreases in intensity and the four acolytes of the drummer take place on stage under feverish applause which intensifies when Nick Mason himself appears to settle nonchalantly to his position. Interstellar Overdrive starts with its riff from beyond the grave, sounding back to the Swingin' London era and his apostle Syd Barrett. This choice indicates the colour that Nick wants to give to these shows. He, the archivist, the historian of the group, will endorse what Waters or Gilmour have never undertaken. Dusting pieces never heard on stage for half a century to revive the pre-Dark Side era PF musical corpus, above which hovers the benevolent ghost of Syd. Astronomy Domine continues the journey in time with a beautiful freshness with this title which we forgot the scenic power, including that of singing which is taken up by Guy Pratt and Spandau Ballet’s Gary Kemp. 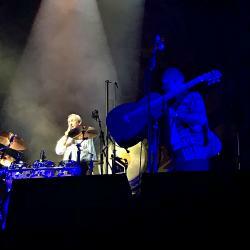 These 2 opening titles have shown a rather tense Nick Mason, revealing nervous twitches and glances in the direction of Guy Pratt, rhythmic support of a drummer under the skin of the beginner. Accustomed to stay in the shadow of his drums, he obviously has little ability to address the public, but he does so with the humour and phlegm that make him such an endearing character. ... "So ... Go On with the show .... "
The show resumes with the evil Lucifer Sam and his Batman riff. It's very exciting to see these musicians having fun like teenagers with this tasty innocence song. Indeed, we enjoy these sounds and phrasing so marked by Syd Barrett who inhabits each verse of the lyrics. The impression will be the same with See Emily Play, Arnold Layne, Vegetable Man or Bike. Fearless is a great introduction to the two songs from Obscured By Clouds that follow. The tones are very soft for the first, the sound of the bass and the drums much more loud for the following. This changes the direction of the concert by showing the sound turn that Pink Floyd took at the dawn of DSOTM in the recesses of the Château d'Hérouville. Arnold Layne and Vegetable Man are striking, the impact of the first still as punchy and Vegetable Man, never played on stage and "never really finished which explains why it is so short," is the total incarnation of the so singular writing of Syd. These guys pay tribute to the dandy without whom nothing would have ever existed. His soberly projected portrait is long applauded, a very touching moment. The strings of If accompany the doubts of a young Roger Waters prey to his first existential questions. Atom Heart Mother burst with a masterful force and an electric version back to the Pink Floyd of 1970 or 71. The epic form of this title is incredible to see on stage, the so cinematographic melody forms a case of a fragile delicacy to the mythical quadriptych. The fury of The Nile Song and its pre-grunge riffs awakes the audience in full contemplation. 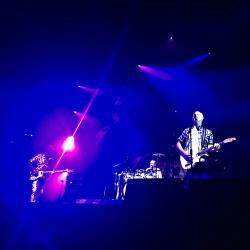 Guy Pratt gives himself to his heart's content, himself a fan of this title he had proposed to Gilmour in 2006 at the Olympia ... David had told him that he could play it when he would be in another band ... now he can! We stay with the More album More with Green Is The Colour and the Gilmourian declaration wrapped in elegiac layers of synths. 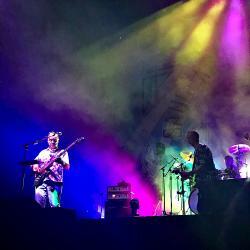 The concert continues now in a colourful vein with Let There Be More Light whose unique bass riff introduces this refrain that forms a very peculiar synthesis of what Pink Floyd could do when it freed himself from Syd. See Emily Play and Bike are the demonstration of the mastery of the group with these titles having that so singular tone. 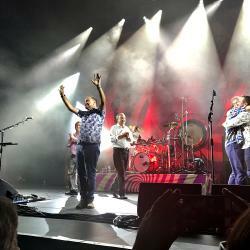 The hypnotic tune of Set The Controls For The Heart Of The Sun brings the audience back to the immemorial time of Live At Pompeii, Guy Pratt is perfectly convincing singing while Nick rolls his drums with the ease of a young man. The concert comes to an end with One Of These Days, led by Pratt's strings and Kemp and Harris who blaze the room with irresistible guitar solos. 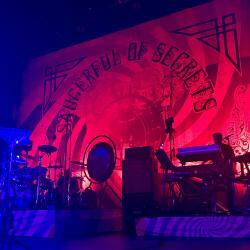 There is a form of audacity to propose A Saucerful Of Secrets as an encore. The distortions of the introduction recall the spectators and Celestial Voices will soon overtake the whole room of the Olympia. Gilmour sings with his hair in the wind, Waters leaning on his bass with a cigarette on his lips, Wright playing with his elbows and Mason running his rototoms with his glorious moustaches and sideburns…. Oh sorry, I have to come back to those fantastic guys who just blow our minds with such an epic reprise. 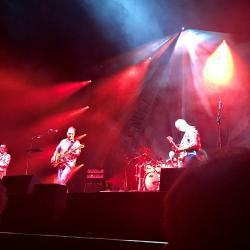 Guy Pratt doesn’t forget to pay tribute to the late Rick Wright, who he used to know so well. 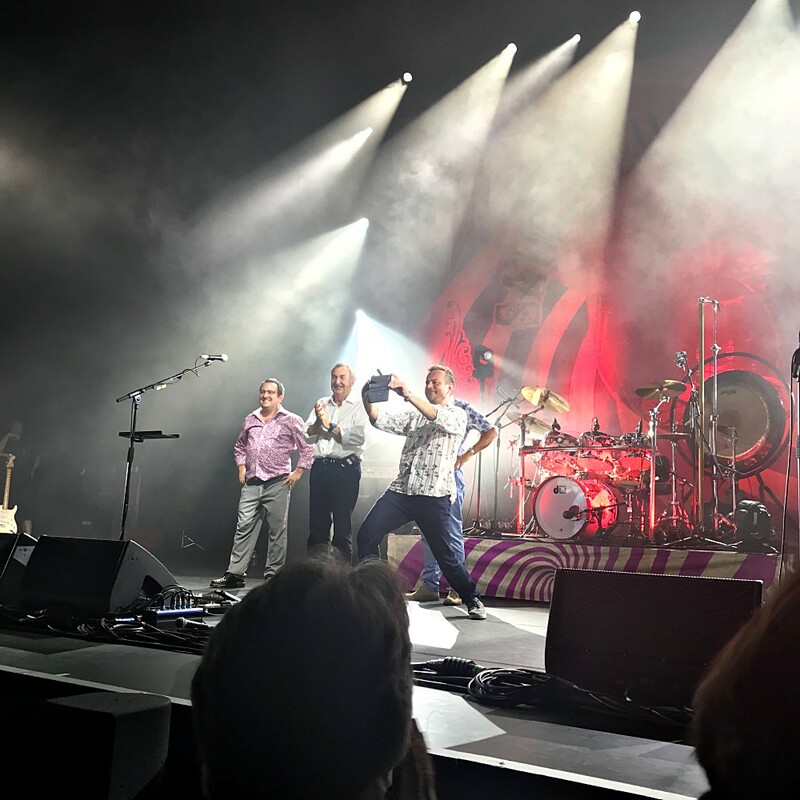 Point Me At The Sky happily concludes the show and proves again that Nick Mason's bet is perfectly successful and legitimate, avoiding the pitfall of resuming pieces heard at Roger's or David's live shows. He has surrounded himself with excellent musicians and the choice of the tracks shows his desire to make (re) live to people the sounds that have generated one of the best selling albums of all time. The way he does is full of his modesty but the result is not less bluffing, as the pleasure of playing these old titles is communicative without too much nostalgia.